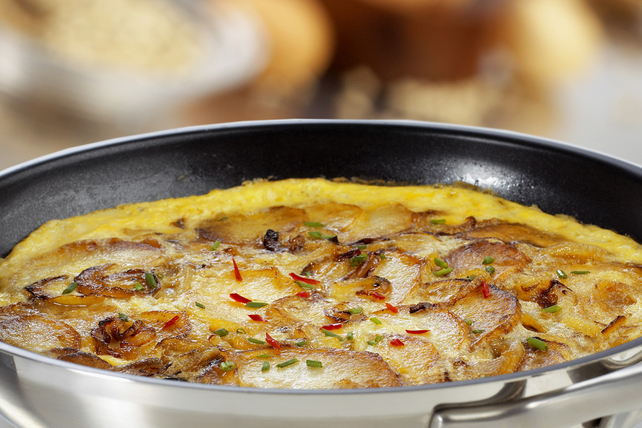 Sliced potatoes lend a hearty appeal to this tasty frittata. We added chives and crushed red pepper for colour and flavour. Heat oil in medium ovenproof skillet on medium heat. Add potatoes; cook 10 to 15 min. or just until tender, stirring occasionally. Whisk eggs and milk in medium bowl until blended. Stir in 1/2 cup cheese, chives and crushed pepper; pour over potatoes. Bake 20 to 25 min. or until knife inserted in centre comes out clean. Heat broiler. Sprinkle frittata with remaining cheese. Broil, 4 inches from heat, 2 to 3 min. or until cheese is melted. For a delightful brunch idea, serve this Spicy Potato Frittata with Chives with a seasonal fruit salad. Crushed red pepper is made from dried hot red chili peppers.